Service Dogs by Warren Retrievers, or "SDWR," delivered a custom trained Diabetic Alert dog today to Tanner, a 13-year-old boy in Gilroy, California. Gilroy, CA, September 29, 2018 --(PR.com)-- Tanner, a 13-year-old boy in Gilroy, California, received a very special delivery today of his very own Diabetic Alert Service Dog from Service Dogs by Warren Retrievers. 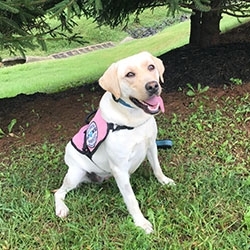 Based in Madison, Virginia, Service Dogs by Warren Retrievers, or “SDWR,” has a mission to provide specially-bred and trained dogs for people of all ages that struggle with living with invisible disabilities such as Autism, PTSD, Seizure Disorders, or in the case of Tanner - Diabetes. SDWR has several hundred service dogs working around the globe and is currently serving approximately 1,000 families. SDWR uses a proprietary scent training method to teach Diabetic Alert Dogs to detect fluctuations in blood sugar that fall outside of a handler’s healthy range. Since Kelsey is a service dog and covered under laws in accordance with the Americans with Disabilities Act (ADA), he will be able to accompany Tanner and his family everywhere - from school, to football games, even to the beach.